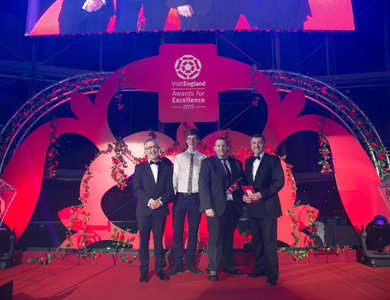 The winners of the VisitEngland Awards for Excellence 2015 were revealed at its annual ceremony, held on Monday 11 May at the spectacular Sage Gateshead. Celebrating excellence across the tourism industry, 17 winners including Best Small Hotel, Tourism Pub of the Year, Best Visitor Attraction and Tourism Event of the Year were announced. ***Each of the Lancashire finalists was a winner of the Lancashire Tourism Awards, which were held at Blackpool Tower Ballroom on 6 November 2014. These awards celebrate the very best of Lancashire’s visitor economy businesses and most of the winners then have the chance to go forward to the national Visit England Awards for Excellence. Please see below for full list of winners. Two special awards celebrating individual excellence; Outstanding Contribution to Tourism and Tourism Superstar (run by VisitEngland in partnership with the Daily Mirror) were amongst the winners. ‘The Chefs of England’ were awarded the prestigious Outstanding Contribution to Tourism award. England has a growing reputation for quality food being served across the country; enticing visitors from both home and abroad. With such a huge choice of fantastic restaurants, pubs and hotels offering high calibre food, the award honoured the impact good food has on English tourism. Accepting the award on behalf of ‘The Chefs of England’ was Hrishikesh Desai, winner of Chefs on Trial, the popular BBC2 TV series featuring hotel expert Alex Polizzi. Hrishikesh beat off stiff competition to be crowned Executive Head Chef at The Gilpin Hotel & Lake House, an exclusive country house hotel in the Lake District. Recognised for winning Tourism Superstar 2015 earlier this year, Matthew Henderson from Beamish Museum in County Durham accepted his award on the evening. Receiving 36% of the total votes cast, Matthew was presented with his accolade by Nigel Thompson, Daily Mirror’s Travel Editor. Over 21,400 votes were generated in total for this award – a record since the competition started in 2012. The Tourism Superstar recognises the dedication and passion of those working in the tourism industry; who go above and beyond the call of duty to ensure visitors to England have a priceless experience. Sandcastle Waterpark’s Sue Copp, Guest Service and Inclusion Manager, came third in the public vote and received a Bronze Award.